Discover out-of-the-way places like Fairyland Loop Trail and Peek-A-Boo Loop. Next up on the itinerary: trek along Rainbow Point, stroll through Navajo/Queens Garden Loop, take some stellar pictures from Sunrise Point, and take in the dramatic natural features at Thor's Hammer. To find maps, reviews, and tourist information, you can read our Bryce Canyon National Park trip itinerary maker . Helsinki, Finland to Bryce Canyon National Park is an approximately 25-hour flight. You'll gain 9 hours traveling from Helsinki to Bryce Canyon National Park due to the time zone difference. Traveling from Helsinki in April, you will find days in Bryce Canyon National Park are a bit warmer (15°C), and nights are slightly colder (-4°C). Finish your sightseeing early on the 13th (Mon) to allow enough time to drive to Kanab. Kanab is a city in and the county seat of Kane County, Utah, United States. You'll discover tucked-away gems like Photography Tours and Cottonwood Canyon Road. There's much more to do: stroll through Wire Pass Trail (Buckskin Gulch access), look for all kinds of wild species at Best Friends Animal Sanctuary, hike along Squaw Trail, and take in the exciting artwork at Raven's Heart Gallery. To find more things to do, maps, and other tourist information, read Kanab tour planner. 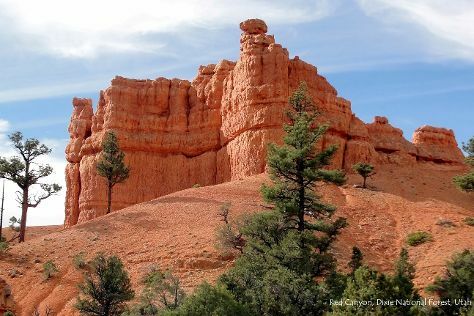 You can drive from Bryce Canyon National Park to Kanab in 2 hours. Traveling from Bryce Canyon National Park in April, things will get somewhat warmer in Kanab: highs are around 24°C and lows about 1°C. Finish your sightseeing early on the 17th (Fri) to allow enough time to drive to Zion National Park. Explore hidden gems such as Riverside Walk and Checkerboard Mesa. Spend the 19th (Sun) exploring nature at Court of the Patriarchs. Spend the 20th (Mon) exploring nature at Zion National Park. And it doesn't end there: hike along Watchman Trail, stroll through Kayenta Trail, grab your bike and head to Pa'rus Trail, and take a memorable drive along Zion Shuttle. To see reviews, photos, traveler tips, and other tourist information, refer to the Zion National Park trip builder website . Drive from Kanab to Zion National Park in 2 hours. In April, daily temperatures in Zion National Park can reach 24°C, while at night they dip to 1°C. Finish up your sightseeing early on the 24th (Fri) so you can go by car to Cedar City. Cedar City is a city in Iron County, Utah, United States, 250mi south of Salt Lake City, and 180mi north of Las Vegas on Interstate 15. Discover out-of-the-way places like Dixie National Forest and Southern Utah Museum of Art. Step out of Cedar City to go to Brian Head and see Brian Head Resort, which is approximately 40 minutes away. There's much more to do: examine the collection at Frontier Homestead State Park Museum, make a trip to Cascade Falls, shop like a local with Artisans Gallery, and play a few rounds at Cedar Ridge Golf Course. To find ratings, photos, and more tourist information, read Cedar City trip itinerary builder tool . Drive from Zion National Park to Cedar City in 1.5 hours. When traveling from Zion National Park in April, plan for little chillier days and about the same nights in Cedar City: temperatures range from 20°C by day to 0°C at night. Wrap up your sightseeing by early afternoon on the 28th (Tue) to allow enough time to travel back home.